Vacuum Pump Market Size was estimated to be beyond USD 4 billion in 2017 and will witness growth at a CAGR more than 6%. Vacuum pump application in the semiconductor industry started at its nascent stage in the 1980’s and has witnessed an exponential growth in the demand ever since. Dry type vacuum pumps are highly popular in this sector as they provide clean and dry manufacturing environment for chips and circuit boards. The global semiconductor industry was estimated to cross USD 400 billion in 2017, driven by high demand from the millennial population. Rising purchase power of the middle-class population around the world, in addition to rapid technological developments in the electronics products such as computers, mobile phone, and tablets, will further boost the semiconductor & electronics sales in the coming years. This is likely to prove beneficial to the global vacuum pump market over the forecast span. Significant developments in the pharmaceutical industry, especially in the developed regions of North America and Europe, will positively influence the product demand over the next few years. Vacuum pumps are essentially employed in the pharmaceutical sector to maintain the perfect reaction environments during the manufacturing of active pharmaceutical ingredients (APIs), intermediate products, and bulk drugs. Nominal spending on pharmaceutical products crossed USD 450 billion in 2017 in the U.S. alone. Outbreak of various diseases due to the changing climatic conditions and living habits, coupled with rapid advancements in medical research will have a significant effect on the medicine sales, thus boosting the vacuum pump market. High costs involved in product operation and maintenance poses a threat to the global vacuum pump market growth. Majority of the small and medium scale end-users lack proper knowledge about the machine operations which end up in damaging the machines frequently. Due to this, many manufacturers are hesitant to provide consistent and low cost after sales support. Correct training of the operators organized by the manufacturers, end-users, and/or third-party agencies is essential in order to confirm a smooth running and longer product life cycle. The product is available in two lubrication options, viz. dry and wet. Dry vacuum pumps are not lubricated by oil or water and provide contamination free environment throughout its running life. They require lesser maintenance due to lower number of moving parts and are typically used in critical application areas such as pharmaceutical and semiconductor industries. Wet vacuum pumps include oil and water lubricated machines and are employed where the pumping speed required is considerably high. This segment registered a revenue of over USD 3 billion in 2017 and will lose its share to the dry type driven by an exponential growth in the semiconductor & electronics industry. 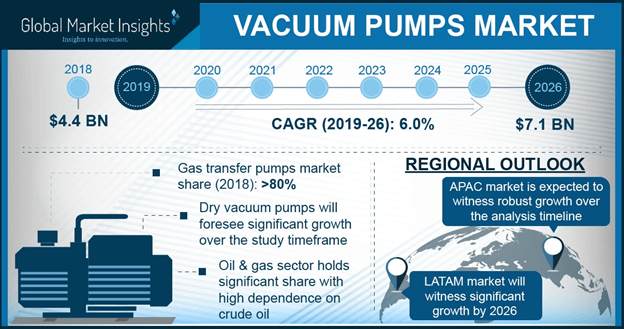 Based on technology, gas transfer vacuum pumps dominated the market with more than 80% of the overall share. These products include positive displacement and kinetic products, where kinetic types generated close to USD 2 billion in 2017. These are high pressure products used in heavy duty applications such as crude oil pipelines, chemical transportation, power generation, etc. Gas capture/binding type products are based on the principle of binding the gas by gettering or condensing at suitable temperature ranges and will witness a faster growth rate owing to its rising popularity in various end-user industries. On the basis of product, the industry is segmented into low, medium, and high vacuum pumps. This segmentation is done on the basis of the product’s respective ultimate pressure ranges. Low vacuum pumps are a highly popular choice among the laboratory operators and research personnel, where the ultimate pressure range is above 100 Pascals. In 2017, high vacuum pumps segment registered a revenue more than USD 1.5 billion and will witness the fastest growth driven by the fast growth rate of its end-user industries. These products are capable of reaching the ultimate pressure as low as 10-10 Pascals and are employed in highly critical application areas. Semiconductor & electronics sector will hold sway the entire vacuum pump industry, registering over USD 1.5 billion in 2017. It will also be the fastest growing segment with the advent of digital age. Rapidly growing smartphone and computer sales across the globe and rising focus on smart technologies in almost all end-use sectors will be the major factors influencing the segment growth. The gradual recovery of the oil & gas sector with rising investments for exploration and drilling activities, especially in North America, is a major influencing factor for the product demand growth in this sector. It finds extensive usage in the transmission and distribution of petrochemicals and natural gas. The oil & gas sector generated a revenue of more than USD 500 million in 2017. Asia Pacific, driven by the strong presence of chemical and semiconductor manufacturers, dominated the global market, accounting for close to a half of the entire industry. The region is also characterized by a large number of small and medium scale vacuum pump manufacturers and suppliers. India vacuum pump market will witness growth with almost 7% CAGR over the forecast span. Germany vacuum pump market size was recorded at over USD 150 million in 2017 and will witness the fastest growth among the European countries. In terms of growth rate, Germany is closely followed by France, driven by the significant presence of chemical & pharmaceutical industries in the country. 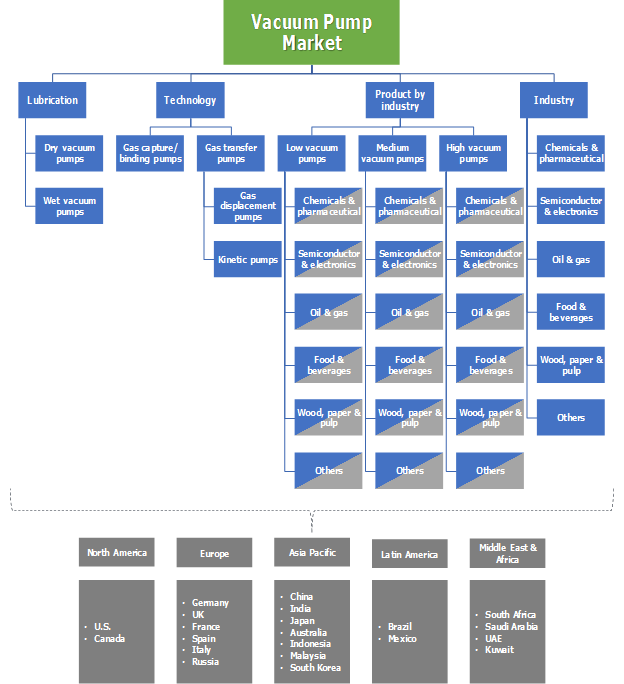 The global vacuum pump market is fragmented with the presence of several manufacturing companies. The key industry participants include Atlas Copco, Pfeiffer, Gardner Denver, Agilent, ULVAC, Ebara, Busch, Shimadzu, Kashiyama, KNF Neuberger, Becker, and DEKKER. The competitive landscape is characterized by several strategic initiatives such as product development and merger & acquisitions. Atlas Copco, for instance, launched three new products in 2017 to enhance their product portfolio and gain their hold on the market. Vacuum pump industry is technology oriented. Product manufacturers need to adhere to stringent norms imposed by various global and regional bodies including International Organization for Standardization (ISO), American Petroleum Institute (API), European Committee for Standardization (CEN), etc. These standards are in place to ensure proper designing, manufacturing, testing, and use of the product in different sectors. New technological developments in the working methodologies and enhancing the product efficiencies will be a key growth factor for the existing industry players.